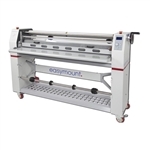 This is a full-featured 42" digital laminator that will increase the speed and productivity for your laminating and mounting jobs. Designed for pressure-sensitive applications with 45° C (113° F) heat assist, It features a full digital control panel, integrated media and release liner takeup units, lift up feed table, pressure gauge crank handle for precise pressure, while capable of mounting up to 1"/25mm thick materials. Unit is brand new in the crate and ready to ship! 1 year parts warranty included.